This entry was posted on Friday, February 5th, 2016 at 3:47 pm	and is filed under Backyard chickens, Chickens, Winter. You can follow any responses to this entry through the RSS 2.0 feed. You can leave a response, or trackback from your own site. Hope you are feeling better! 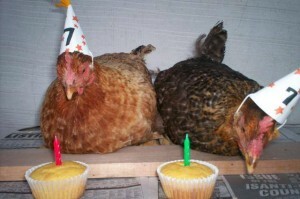 Love the birthday chickens!!!! Better, but not quite out of the woods yet. New episode in the can, though! And more snow on the way. This page took 1.214 seconds of computer labor to produce.